In addition to your course fees, we’d recommend budgeting for around £11,000 for living expenses over a year. Of course, this figure is an indication and will vary for each individual. Everyone knows that one person’s weekly budget might only last another person a couple of days. 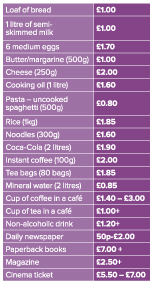 We’re aiming to give you a good idea of costs, but much depends on your own personal choices. The following is only a very rough breakdown of costs per month for a single student in average priced self-catering accommodation. Remember there might be other one-off costs for example for a deposit on your accommodation, insurance or travel costs if you’d like to visit other parts of the UK while you’re here. Hopefully these costs give you an idea of how to plan. You could also have a look at this budget calculator.